For other uses, see Saint Anthony (disambiguation). "Antonious" redirects here. For Antonius, see Antonius. The biography of Anthony's life by Athanasius of Alexandria helped to spread the concept of Christian monasticism, particularly in Western Europe via its Latin translations. He is often erroneously considered the first Christian monk, but as his biography and other sources make clear, there were many ascetics before him. Anthony was, however, the first to go into the wilderness (about AD 270), which seems to have contributed to his renown. [dubious – discuss] Accounts of Anthony enduring supernatural temptation during his sojourn in the Eastern Desert of Egypt inspired the often-repeated subject of the temptation of St. Anthony in Western art and literature. Anthony was born in Coma in Lower Egypt to wealthy landowner parents. When he was about 20 years old, his parents died and left him with the care of his unmarried sister. Shortly thereafter, he decided to follow the Evangelical counsel of Jesus which reads, "If you want to be perfect, go, sell what you have and give to the poor, and you will have treasures in heaven. "[Mt 19:21] Anthony gave away some of his family's lands to his neighbors, sold the remaining property, and donated the funds thus raised to the poor. He then left to live an ascetic life, placing his sister with a group of Christian virgins, a sort of proto-convent in that time. Anthony is sometimes considered the first monk, and the first to initiate solitary desertification, but there were others before him. There were already ascetic pagan hermits (the Therapeutae), and loosely organized cenobitic communities were described by the Hellenized Jewish philosopher Philo of Alexandria in the 1st century AD as long established in the harsh environment of Lake Mareotis and in other less accessible regions. Philo opined that "this class of persons may be met with in many places, for both Greece and barbarian countries want to enjoy whatever is perfectly good." Christian ascetics such as Thecla had likewise retreated to isolated locations at the outskirts of cities. Anthony is notable for having decided to surpass this tradition and headed out into the desert proper. He left for the alkaline Nitrian Desert (later the location of the noted monasteries of Nitria, Kellia, and Scetis) on the edge of the Western Desert about 95 km (59 mi) west of Alexandria. He remained there for 13 years. After he recovered, he made a second effort and went back into the desert to a father mountain by the Nile called Pispir (now Der-el-Memun), opposite Arsinoë. There he lived strictly enclosed in an old abandoned Roman fort for some 20 years. According to Athanasius, the devil again resumed his war against Anthony, only this time the phantoms were in the form of wild beasts, wolves, lions, snakes, and scorpions. They appeared as if they were about to attack him or cut him into pieces. But the saint would laugh at them scornfully and say, "If any of you have any authority over me, only one would have been sufficient to fight me." At his saying this, they disappeared as though in smoke. While in the fort he only communicated with the outside world by a crevice through which food would be passed and he would say a few words. Anthony would prepare a quantity of bread that would sustain him for six months. He did not allow anyone to enter his cell; whoever came to him stood outside and listened to his advice. At the end of Christian persecutions, Anthony returned to his old Roman fort. By this time, many more had heard of his sanctity and he had many more visitors than before. He saw these visits as interfering with his worship and went further into the Eastern Desert. He traveled for three days before reaching a small oasis with a spring and some palm trees and chose to settle there. Disciples soon found him out and his number of visitors again continued to grow. 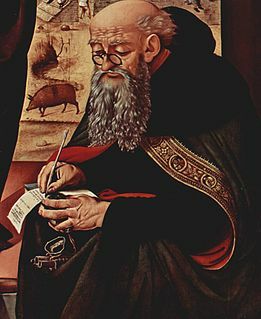 He had not been the first ascetic or hermit, but he may properly be called the "Father of Monasticism" in Christianity, as he organized his disciples into a worshipful community and inspired similar withdrawn communities throughout Egypt and, following the spread of Athanasius's hagiography, the Greek and Roman world. His follower Macarius the Great was particularly active in continuing his legacy. A background story of one of the surviving epistles, directed to Constantine I, recounts how the fame of Saint Anthony spread abroad and reached Emperor Constantine. The Emperor wrote to him offering praise and requesting prayers. The brethren were pleased with the Emperor's letter, but Anthony did not pay any attention to it, and he said to them, "The books of God, the King of Kings and the Lord of Lords, commands us every day, but we do not heed what they tell us, and we turn our backs on them." Under the persistence of the brethren who told him "Emperor Constantine loves the church", he accepted to write him a letter blessing him, and praying for the peace and safety of the empire and the church. According to Athanasius, Saint Anthony heard a voice telling him "Go out and see." He went out and saw an angel who wore a girdle with a cross, one resembling the holy Eskiem (Tonsure or Schema), and on his head was a head cover (Kolansowa). He was sitting while braiding palm leaves, then he stood up to pray, and again he sat to weave. A voice came to him saying, "Anthony, do this and you will rest." Henceforth, he started to wear this tunic that he saw, and began to weave palm leaves, and never was bored again. Saint Anthony prophesied about the persecution that was about to happen to the church and the control of the heretics over it, the church victory and its return to its former glory, and the end of the age. When Saint Macarius visited Anthony, Anthony clothed him with the monk's garb and foretold him what would happen to him. When the day drew near for the departure of Saint Paul the First Hermit in the desert, Saint Anthony went to him and buried him, after clothing him in a tunic which was a present from St Athanasius the Apostolic, the 20th Patriarch of Alexandria. In 338, he left the desert temporarily to visit Alexandria to help refute the teachings of Arius. Although not particularly learned, Anthony was able to confound the Arians. He probably spoke only his native language, Coptic, but his sayings were spread in a Greek translation. He himself wrote letters in Coptic, seven of which are extant. 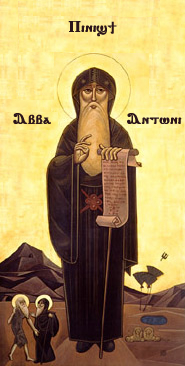 His biography was written by Saint Athanasius and titled Life of Saint Anthony the Great. Many stories are also told about him in various collections of sayings of the Desert Fathers. A copy by the young Michelangelo after an engraving by Martin Schongauer around 1487–9, The Torment of Saint Anthony. Oil and tempera on panel. One of many artistic depictions of Saint Anthony's trials in the desert. Though Anthony himself did not organize or create a monastery, a community grew around him based on his example of living an ascetic and isolated life. Athanasius' biography helped propagate Anthony's ideals. Athanasius writes, "For monks, the life of Anthony is a sufficient example of asceticism." Asceticism is a lifestyle characterized by abstinence from worldly pleasures, often for the purpose of pursuing spiritual goals. Famously, Anthony is said to have faced a series of supernatural temptations during his pilgrimage to the desert. The first to report on the temptation was his contemporary Athanasius of Alexandria. It is possible these events, like the paintings, are full of rich metaphor or in the case of the animals of the desert, perhaps a vision or dream. Some of the stories included in Saint Anthony's biography are perpetuated now mostly in paintings, where they give an opportunity for artists to depict their more lurid or bizarre interpretations. Many artists, including Martin Schongauer, Hieronymus Bosch, Dorothea Tanning, Max Ernst, Leonora Carrington and Salvador Dalí, have depicted these incidents from the life of Anthony; in prose, the tale was retold and embellished by Gustave Flaubert in The Temptation of Saint Anthony. Emphasis on these stories, however, did not really begin until the Middle Ages, when the psychology of the individual became of greater interest. Below are some of the tales. The Meeting of Saint Anthony and Saint Paul, Master of the Osservanza, 15th century, with the centaur at the background. Saint Anthony was on a journey in the desert to find Saint Paul of Thebes, who according to his dream was a better Hermit than he. Saint Anthony had been under the impression that he was the first person to ever dwell in the desert; however, due to the dream, Saint Anthony was called into the desert to find his "better", Saint Paul. On his way there, he ran into two creatures in the forms of a centaur and a satyr. Although chroniclers sometimes postulated they might have been living beings, Western theology considers to have been demons. While traveling through the desert, Saint Anthony first found the centaur, a "creature of mingled shape, half horse half man," whom he asked about directions. The creature tried to speak in an unintelligible language, but ultimately pointed with his hand the way desired, and then ran away and vanished from sight. It was interpreted as a demon trying to terrify him, or alternately a creature engendered by the desert. Saint Anthony found next the satyr, a "a mannikin with hooked snout, horned forehead, and extremities like goats's feet." This creature was peaceful and offered him fruits, and when Saint Anthony asked who he was, the satyr replied, "I'm a mortal being and one of those inhabitants of the desert whom the Gentiles deluded by various forms of error worship under the names of Fauns, Satyrs, and Incubi. I am sent to represent my tribe. We pray you in our behalf to entreat the favor of your Lord and ours, who, we have learnt, came once to save the world, and 'whose sound has gone forth into all the earth.'" Upon hearing this, Saint Anthony was overjoyed and rejoiced over the glory of Christ. He condemned the city of Alexandria for worshipping monsters instead of God while beasts like the satyr spoke about Christ. Another time Saint Anthony was travelling in the desert and found a plate of silver coins in his path. Once, Saint Anthony tried hiding in a cave to escape the demons that plagued him. There were so many little demons in the cave though that Saint Anthony's servant had to carry him out because they had beaten him to death. When the hermits were gathered to Saint Anthony's corpse to mourn his death, Saint Anthony was revived. He demanded that his servants take him back to that cave where the demons had beaten him. When he got there he called out to the demons, and they came back as wild beasts to rip him to shreds. All of a sudden a bright light flashed, and the demons ran away. Saint Anthony knew that the light must have come from God, and he asked God where was he before when the demons attacked him. God replied, "I was here but I would see and abide to see thy battle, and because thou hast mainly fought and well maintained thy battle, I shall make thy name to be spread through all the world." Most of what is known about Saint Anthony comes from the Life of Anthony. Written in Greek around 360 by Athanasius of Alexandria, it depicts Anthony as an illiterate and holy man who through his existence in a primordial landscape has an absolute connection to the divine truth, which always is in harmony with that of Athanasius as the biographer. Sometime before 374 it was translated into Latin by Evagrius of Antioch. The Latin translation helped the Life become one of the best known works of literature in the Christian world, a status it would hold through the Middle Ages. In addition to the Life, several surviving homilies and epistles of varying authenticity provide some additional autobiographical detail. Anthony had been secretly buried on the mountain-top where he had chosen to live. His remains were reportedly discovered in 361, and transferred to Alexandria. Some time later, they were taken from Alexandria to Constantinople, so that they might escape the destruction being perpetrated by invading Saracens. In the eleventh century, the Byzantine emperor gave them to the French Count Jocelin. Jocelin had them transferred to La-Motte-Saint-Didier, which was then renamed Saint-Antoine-en-Dauphiné. There, Anthony is credited with assisting in a number of miraculous healings, primarily from ergotism, which became known as "St. Anthony's Fire". He was credited by two local noblemen of assisting them in recovery from the disease. They then founded the Hospital Brothers of St. Anthony in honor of him, who specialized in nursing the victims of skin diseases. Veneration of Anthony in the East is more restrained. There are comparatively few icons and paintings of him. He is, however, regarded as the "first master of the desert and the pinnacle of holy monks", and there are monastic communities of the Maronite, Chaldean, and Orthodox churches which state that they follow his monastic rule. During the Middle Ages, Anthony, along with Quirinus of Neuss, Cornelius and Hubertus, was venerated as one of the Four Holy Marshals (Vier Marschälle Gottes) in the Rhineland. Examples of purely Coptic literature are the works of Saint Anthony and Saint Pachomius, who only spoke Coptic, and the sermons and preachings of Saint Shenouda the Archmandrite, who chose to only write in Coptic. Saint Shenouda was a popular leader who only spoke to Copts in the Egyptian language (Coptic), not in Greek. The main character in the Hervey Allen novel Anthony Adverse, and the 1936 film of the same name, is an abandoned child who is placed in a foundling wheel on the saint's feast day, and given the name Anthony in his honor. ^ Jack Tresidder, ed. (2005). The Complete Dictionary of Symbols. San Francisco: Chronicle Books. ISBN 0-8118-4767-5. ^ Cornwell, Hilarie; James Cornwell (2009). Saints, Signs, and Symbols (3rd ed.). Harrisburg: Morehouse Publishing. ISBN 0-8192-2345-X. ^ a b c d e f g h i j Michael Walsh, ed. (1991). Butler's Lives of the Saints (Concise, Revised & Updated, 1st HarperCollins ed.). San Francisco: HarperSanFrancisco. ISBN 0-06-069299-5. ^ "Pontificia Accademia Ecclesiastica, Cenni storici (1701-2001)". Pontificia Accademia Ecclesiastica (in Italian). Vatican, Roman Curia. Retrieved 17 January 2017. ^ a b c Endsjø, Dag Øistein (2008). Primordial landscapes, Incorruptible Bodies. New York: Peter Lang Publishing. ISBN 1-4331-0181-5. ^ Athanasius (1998). Life of Antony. 3. Carolinne White, trans. London: Penguin Books. p. 10. ISBN 0-8146-2377-8. ^ a b c EB (1911). ^ Sax, Boria. "How Saint Anthony Brought Fire to the World". Retrieved 2013-01-04. ^ "A few words about the life and writings of St. Anthony the Great". orthodoxthought.sovietpedia.com. Retrieved 2017-03-24. ^ Philo. De Vita Contemplativa [English: The Contemplative Life]. .
^ "Saint Anthony Father of the Monks". www.coptic.net. ^ "Catholic Encyclopedia – St. Anthony". New Advent. ^ Bacchus, Francis. "CATHOLIC ENCYCLOPEDIA: Saint Paul the Hermit". Robert Appleton Company. Retrieved 2013-01-04. ^ "Venerable and God-bearing Father Anthony the Great". oca.org. Retrieved 2017-12-11. ^ "The Golden Legend: The Life of Anthony of Egypt". Archived from the original on 23 January 2013. Retrieved 2013-01-04. ^ "Quirinus von Rom" [English: Quirinus of Rome] (in German). Retrieved 25 April 2012. ^ "Coptic Literature". Retrieved 2013-01-04. Wikimedia Commons has media related to Anthony the Great.